The Goldfields are a region rich in outback history, scattered with goldrush settlement towns that are still thriving today! When the goldrush hit Western Australia in the late 1880’s the goldfields saw thriving communities pop up all across the region. Today, many of these towns still exist and are rich in history, outback legends and stories of fortunes and failure. 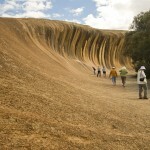 At the heart of the Goldfields is the city of Kalgoorlie-Boulder, a day’s drive from Perth. The city prides itself on its regal architecture and somewhat outback vibe and has an abundance of historic sites that can be explored on a simple stroll through the town centre. Laverton, Cue and Coolgardie are just a few of the still thriving goldrush settlements, while others such as Big Bell are now just eerie ghost towns. From July to September the region comes alight as dazzling displays of wildflowers emerge from the rugged terrain, a major draw card for wildflower enthusiasts. The Goldfields is also the gateway to the true Australian outback journey with the Great Central road to Alice Springs starting in Laverton. Despite the outback vastness of the rugged Goldfields landscape, the region is truly vibrant and alive and holds stories, secrets and journeys waiting to be explored!